When people talk about getting an all-over tan for summer, they're not usually talking about getting an all-over orangutan. But 30-year-old Moksha Bybee has the most unusual of swimming partners - a seven-year-old urangutan who clings to her as she dives beneath the surface. The jungle-dwelling creatures are not known for their love of the water, but Suryia appears to have permanently swapped tree trunks for swimming trunks. And Mrs Bybee says it's virtually impossible to keep Suryia from the pool on a nice day. The two make an unusual sight as they lark about at the Myrtle Beach Safari park in South Carolina. Mrs Bybee said that Suryia spent only three weeks learning how to swim and now can't get enough of his new skill. 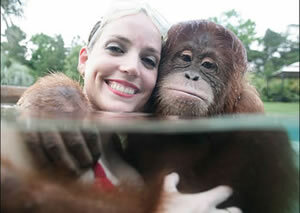 Staff introduced Suryia to their 67ft pool after they noticed he had an unusual love for splashing around in the bath. And he's not just a dab hand at diving - Suryia is able to swim up to 20 feet unaided using his rudimentary 'Borneo crawl'. 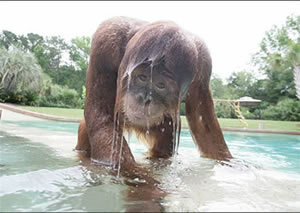 Staff at the park believe that the plucky seven-year-old is the world's first aquatic orangutan.